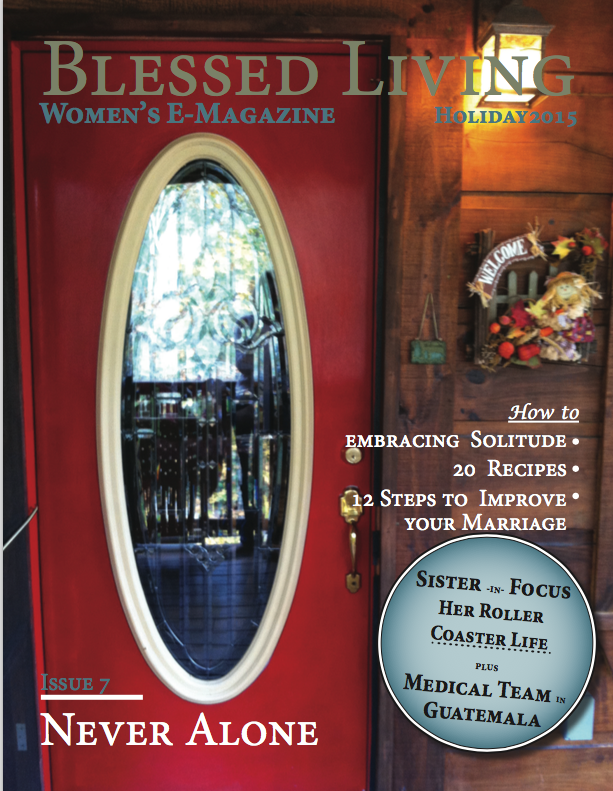 With more than thirty articles and 130 pages this issue is full of inspiring articles, spiritual insights, and practical tips. It will online and available within the week — If the Lord wills. Our Sister-in-Focus is an on-the-go Mom who doesn’t let MS slow her down. The report back from a mission trip to Guatemela will have you wanting to pray for these amazing people. The story from a woman who overcame her abortion to minister in a counseling center might bring you to tears. Have you any questions about service dogs? When you see them around your town do you want to ask, but not sure if you should? Our editor answers the questions she gets asked the most about her service dog, Bishop. God shows His Mercy throughout His creation, learn about a South Florida tree that survives because of the mission of one of its leaves. Have you discovered the joy of solitude? That article will want you to embrace the impact of being alone can have. What is an SSoJ/E? We think you have them everyday, but you didn’t know what to call them when they happen. What’s your favorite invention? Ours is the church, the Body of Christ. In that article our staff teams up to give a few examples when the Body worked as it should and was a true blessing to them. Are you ever baffled by the perversity of so-called diversity? Then we have an article that agrees with you. And then there are the regular columns on Soul + Spirit, Life + Work, and Home + Family.